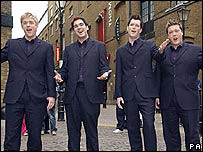 Classical group G4, who appeared in the ITV1 show The X Factor, are to break up after their summer tour. A statement on their website said it had been a "group decision", but it has been reported they decided to part following a spate of rows. Jonathan Ansell told the Daily Mail: "We would be rowing backstage then have to put on fake smiles for the fans." G4 were runners-up on the 2004 series of The X Factor, and went on to outsell the winner, Steve Brookstein. Ansell added: "We would row over the most niggling little things - one of us not looking smart enough, or not having shaved properly." Ben Thapa, another member of the group, told the newspaper, "We did not want to drag on for another couple of years, growing increasingly resentful of each other. "We are still friends and we want to stay friends but we won't if we carry on in G4." But on their website, the band said: "Despite what the papers say, we are all still friends and will be continuing together in the band until the end of the summer." The former buskers, who met while studying at the Guildhall School of Music, sold 1.2 million albums in their first year. Their third album, Act Three, was released last year.